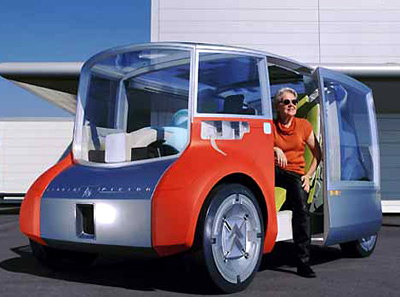 The Citroen Osmose which was revealed at the 2001 Paris Motor Show was a concept which attempted to straddle the divide between a car and public transport. The side of the Osmose had a panel which allowed the driver to display their destination - just like a bus - to advertise to pedestrians in case they wanted a lift! Quite how many potential customers would have used this function will thankfully remain a mystery. 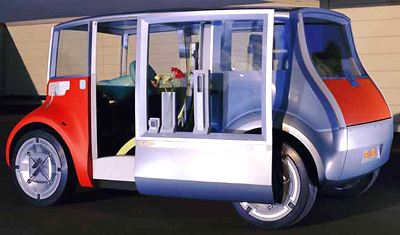 Although the idea itself is interesting, it would pose many problems for the driver, not least security. And hell if you're going to spend your day ferrying random strangers around town you may as well become a taxi driver. 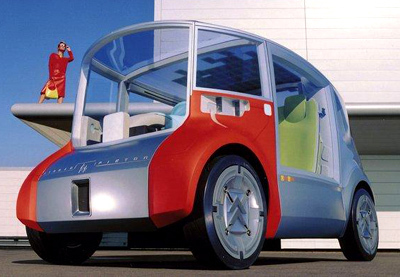 The spacious interior and massive windows made the inside feel more like a mobile conservatory than a car. One can only assume this highly visible interior was supposed to help remove the psychological barrier between drivers and pedestrians. The Osmose was as friendly and unthreatening to pedestrians as it was to the occupants and other motorists. Mounted within the front bumper was a full width airbag, just in case any got in the way.